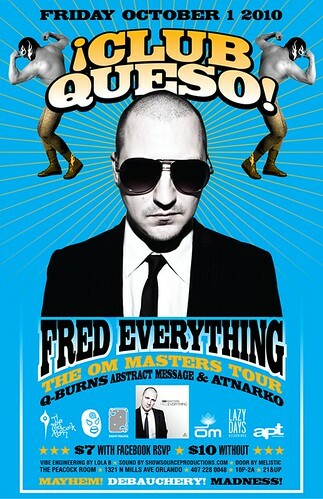 This Friday: Fred Everything at ¡Club Queso! The team at ¡Club Queso! has always promised to bring everything you could ever want in a top notch fun time house music night in Orlando. Now the "everything" bit can be taken literally: transporting down from San Francisco for the next event will be our esteemed DJ friend Fred Everything. In addition to his indisputable floor-quaking DJ skills, Mr. Everything is quite the renowned producer. His debut album, Under The Sun, recorded for Britain's 20/20 Vision label is considered a classic by many. Fred's recent move from Montreal to San Francisco cemented his relationship with Om Records who have released his latest album Lost Together, featuring contributions from Roy Davis Jr., Tortured Soul, Lisa Shaw, and N’dea Davenport from The Brand New Heavies. In addition to all this, Fred commandeers his own Lazy Days label which has released bits by the likes of Brett Johnson, Lovebirds, Joshua IZ, and our own Atnarko. No less than Buzzin Fly's Ben Watt has called Fred Everything "one of my favorite deep house producers." We think he'll soon be one of yours, too, as Everything's Queso debut should inspire your dance floor conversion. A special night of extra special music is in the offing. Sonic support comes in the form of ¡Club Queso! residents Q-Burns Abstract Message and Atnarko who will supply their special brand of deep, funky goodness prior to the main attraction. Lola B will be on hand lovingly adjusting the atmosphere and Show Source Productions will be bringing the booming bassbins. This all happens on Friday, October 1 at The Peacock Room, located at 1321 North Mills Avenue, next to the corner of Mills and Virgina. Click HERE for a map or directions. Call (407) 228-0048 for information. $10 cover for this special event, $7 with Facebook RSVP. 21 and up, doors at 10 PM. We'll see you soon for Fred Everything at ¡Club Queso! P.S. - and on Saturday, October 3, I'll be DJ'ing at Crooked Bayou with my special friend Marcelo Medeiros of Discotheque Radio, visiting all the way from Curitiba, Brazil, and Rob Slac of Chillin Music. More info on this soon … it's gonna be a great weekend for house music in Orlando!